What's better than starting one new project this week? Starting two! Yes, I'm *finally* jumping on the Swoon bandwagon. 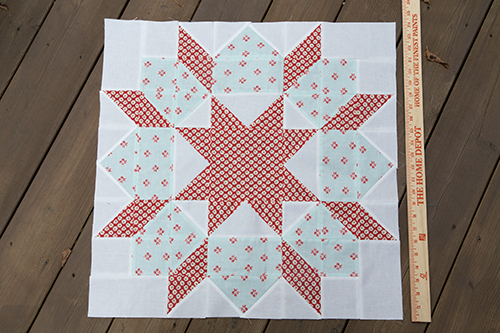 I've wanted to make one ever since I saw Angela's Good Folks Swoon quilt. I knew the blocks were big. But I don't think anything prepares you for the size until you actually make one. I only get my yardstick out for 3 things: 1. Measuring those big Chicago snow storms. 2. Reaching toys the kids throw under our King sized bed. 3. Showing people how big a Swoon quilt block is. 24-1/2"! I'm planning on mixing some prints from Avalon by Fig Tree & Co. with others from my stash. I actually haven't picked all my fabrics yet, so there still may be a bit more ordering. I am using Kona Snow for my background. I'm not going to stress too much over a timeline for this one, but can't wait to make more blocks and share my progress along the way.